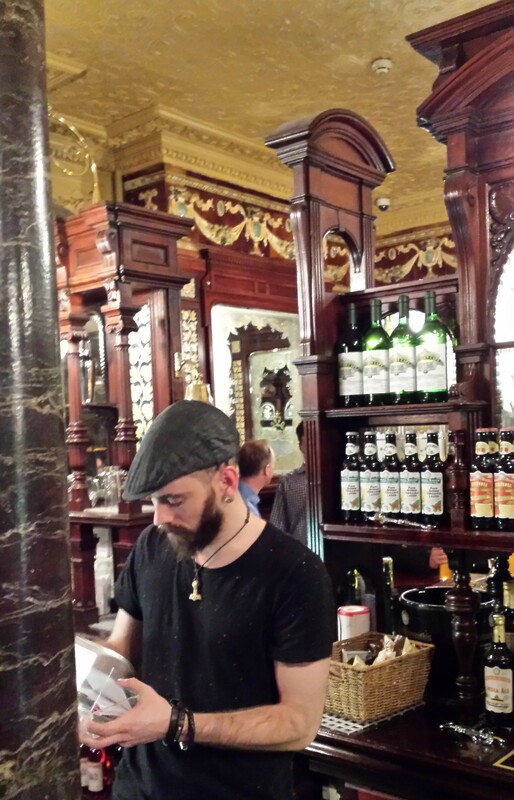 …the Princess Louise public house on High Holborn, London. 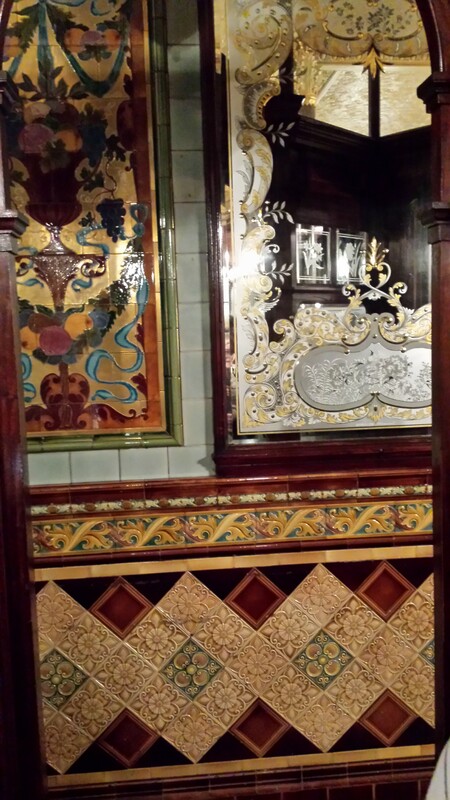 Worth a visit to see the wonderfully preserved Victorian interior, complete with mirrors, tiles, floor mosaics and polished wooden panelling, with booths arranged around a central bar. Built in 1872, the interior was constructed in 1891 and refurbished in 2007. 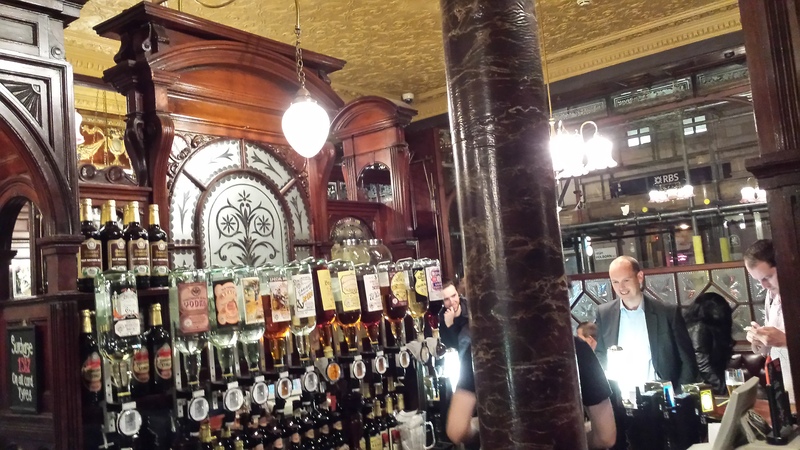 It is Grade II listed, even the urinals, but still functions as a pub, currently under the aegis of Samuel Smiths Breweries ( although the brewery has changed over the years ). 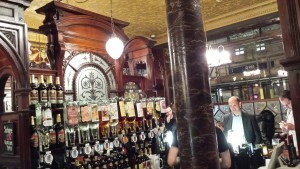 Its entrances are on the busy High Holborn and its important to enter correctly – enter through the doors which are side on to the street and you find yourself confined to the front part of the pub, beautiful but open, enter through the doors facing the street and you enter corridors which run behind a series of wooden booths, affording drinkers comfort and privacy but each opening on to the central ‘island’ bar and with a view of the elaborate plaster ceiling, with its deep, swag cornicing. Each wooden booth has room for up to a dozen people ( at a pinch ) – there were eight folk in ours when I last visited and plenty of room. 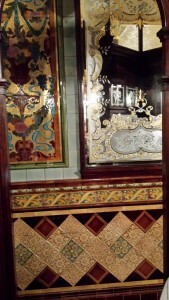 The opening on to the bar is flanked by marble columns and corridors running behind the booths have ornate floor mosaics, fine gilded wall tiles and intaglio’d mirrors ( see right ). Historically it was, because of its location, associated with the academics, students and workers of the University of London and the British Museum. I remember coming here with academic friends when visiting London in the early 1980s, when it was still one open room, before it was restored to its full glory. The beer was good then too. So was the music, something of a tradition at the Princess. In the 1950s and 60s it was part of a resurgent Bloomsbury and, in particular, of the folk music revival. Famous musicians who have played here include Bert Jansch, the Pentangle band and Ewan McCall. The front elevation of the exterior of the pub is currently ( October 2015 ) undergoing refurbishment, so scaffolding obscures the street view of the building – including the pub sign. Approaching from Holborn station, the nearest underground, ( Central Line ) the pub is on the left of High Holborn, passed the super-market and a number of banks and offices. It is open from Monday to Friday 11.00 a.m. to 11.00 p.m., 12 noon until 11.00 p.m. on Saturday and 12 noon until 6.45 p.m. on Sundays. Food is served at lunchtime and, sometimes, in the evening but I haven’t tried it.